For as long as I can remember I have never been good at talking about my feelings. But I have been pretty damn great at writing my heart out. My sister always said that it would do me a world of good to date people who were a little unlike me. She said that if both of us would write – it wouldn’t really help either of us much in the end. She’s been right about a lot of things. But she was wrong about this one. You see, it doesn’t matter whether a person likes writing or doesn’t like writing. You become an annoying nuisance if you keep running off into the arms of poetry and hide behind a veil of words every time the world remotely hurts you. Yet you cower in the shadows and wonder if they would come and join you, talk to you, take your hand and lead you back into the world. Or if they would ignore everything and just wait for you to show up when they expect you to! Every fight inspires you to write. Every heart ache births yet another verse. And sometimes you stop talking in the middle of a sentence because a new story has taken its root in your head. But the person standing next you, the one at the receiving end of your tirade of tales and your endless messages gets tired, gets frustrated and itches to let go of your hand. You turn to them with eyes shining with hope and recognize something that wasn’t there before. They are looking at you with pity. They are looking at you the way one would look at you before delivering really bad news. You’ve already had enough though. 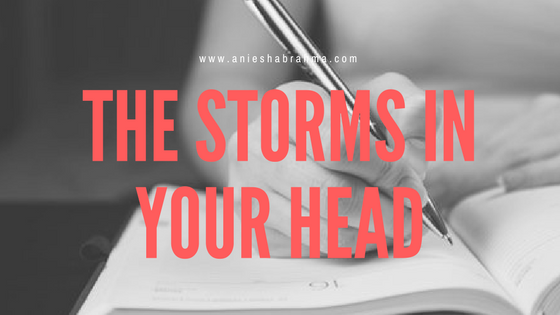 You’ve had enough of people unable to keep up with the storms in your head. People accusing you of living in a land made of fairy tale Princes and dragons, and maybe just a touch of magic. Before they can tell you that things might not be okay between us – you violently push them away. Tell them that you don’t think they understand your world. They breathe a sigh of relief. Wear a mask that almost looks sincerely sorry but run away from you the next second. No one can keep up with the words raging inside of your head. No one realizes that sometimes the only way to deal with anxieties is to pen them down. That ignored text messages don’t always mean they’re busy. But sends across a message that you have been bothering them, and that was when you started plotting your escape. That was when you decided the first chance you get you would walk away. You have always been great at knowing when to run. You have always known how to protect your heart. The only time you decided to let your guard down, decided that the odds could be in your favour, decided that it could last – they let go off your hand in the dark. And you stood there groping the dark, angrily blinking away the tears before letting the words come coursing through your head and you wrote and wrote and wrote until you felt better again. People say writers exaggerate. That we use almost everything as an excuse to fuel our writing but here’s a little secret I will let you in on. We write because we have been hurt far too many times. We write to accept things we have no idea how to deal with. We write because not writing would make us go completely insane. And every time our heart breaks, we write because we need to feel something again. A side note for the next person who falls in love with you, who wants to date you or who even wants to see where it goes – be okay with waking up to endless texts. Be okay with finding emails in your inbox, and if you’re lucky you would even find handwritten notes strewn across your life. Please don’t stop writing just because the other person doesn’t like their life littered with letters. Wait for the person who would be thrilled to wake up to your words, who would kiss you good morning and tell you for the thousandth time that was a sweet note. Because everything that you write is very much a part of who you are. If they reject your writing, please remember they’re actually rejecting you. Please continue writing your heart out. Because that is who you are – don’t ever think about changing! How's Kolkata Book Fair? I hope you do posts on that.. :) :) Are you doing the 'Fave Friday' posts anymore..?